Friends – I have to admit that I know very little about what it might be like to be a Chinese-American man. The only male friend of Chinese-American descent that I can remember ever having was my friend Pete. I got to know Pete in St. Louis in the mid 70’s when we were both graduate students, and I met up with him again in Paris. Pete was apparently extremely wealthy. I was young and had known other wealthy people so I didn’t really think about this, until he met me in Paris, where he had an apartment (!) and he took me out for dinner at an incredibly fancy Chinese restaurant. Pete ordered for us, and then proceeded to critique the waiter’s Mandarin. After dinner we walked around the city, and Pete took a photograph with an impossibly tiny camera. “They are new,” he said, shrugging. Then we looked out over the city from I forget which bridge and we had a conversation about money. “I wish,” he said “I had so much money I never had to think about food.” I laughed at this – it seemed so crazy. “You seem like you’re doing ok to me,” I said. “Yes,” he said. “But I have to think about it.” With that, he walked me back to the crappy dorm I was staying in and he went back to his apartment. I know. This is not exactly a representative experience. But it’s the experience I had. 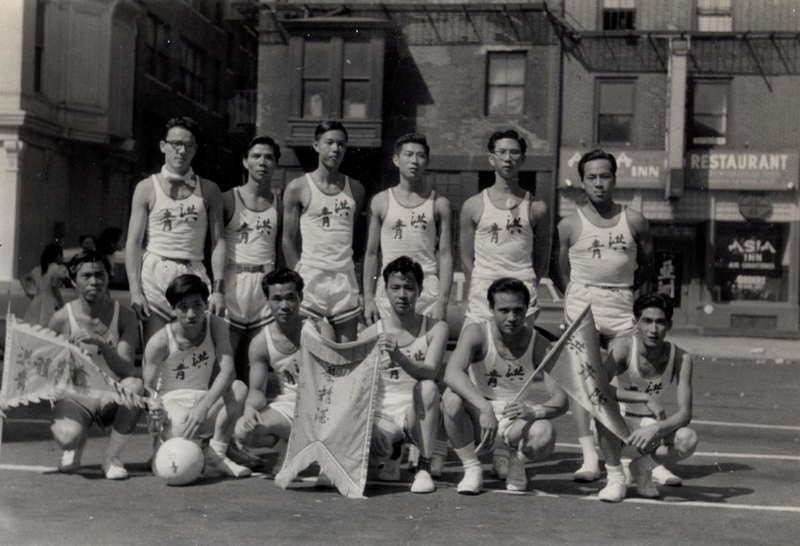 Watching the film documentary 9-Man, I was forced to think about all the other Chinese-American men I have had contact with in New York and Los Angeles (the city where I was born and where I grew up and the city where I have lived for 16 years). Yes, my parents used a Chinese laundry in Manhattan. Yes, I went to Chinatown, both in NYC and LA all the time to eat. The man at the Chinese laundry and all the male servers at all those restaurants – why haven’t I ever thought about them? The embarrassing answer is: because I didn’t notice them. 9-Man brings Chinese American men into a dazzling, complicated light. 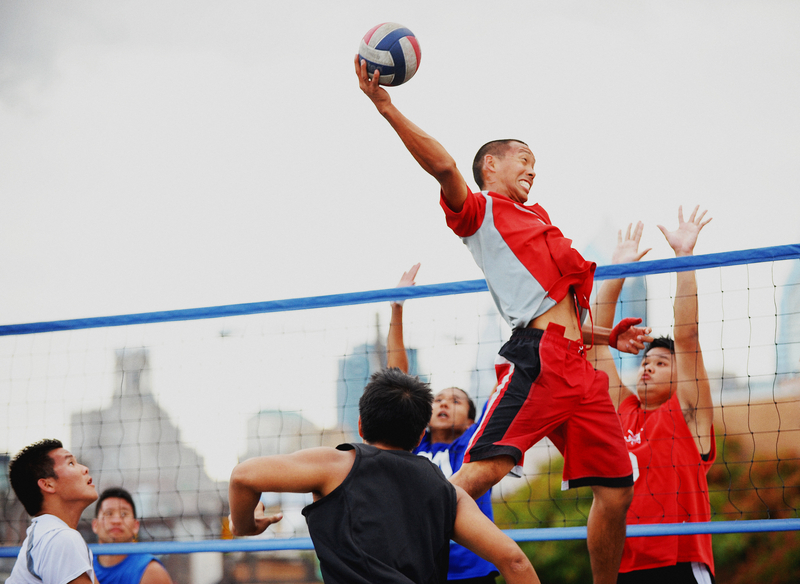 The film depicts generations of passionate, competitive amateur athletes who play their hearts out in special Chinese-style volley-ball leagues. The games take place in the street, where fans dance under the canopy of those enormous Chinese dragons that you see in parades on Chinese New Year. There are complicated rules about who can play and who can’t (you have to have some Chinese heritage to play, except for 3 positions on the team which are open to other kinds of Asians [but not Indians, apparently]). The players on the team don’t rotate like in American volleyball, and there are other rules and regulations that I don’t remember, because I’m terrible at sports. One older, former player speaks in an interview about being relegated to “feminine” work – that of the laundry and the restaurant – and how playing 9 -man restored his sense of respect and dignity. It’s an immigrant’s game, another former player told the camera, with one of the first balls being a bunch of towels wrapped together and wrapped with string. Like I said, I’m no athlete, but I felt real respect and admiration for these men and boys. Particularly so as the film’s story unfolds, becoming — not the usual American tale of underdogs winning against amazing odds – but something more complicated. I won’t spoil the resolution for you, but it isn’t what you expect. I think the ending will impress you. It did me. Art can do a lot of things. I like to think it can help us think beyond the limits of our own experience. Just this afternoon, I heard a young man speaking Mandarin (I think) and English to someone in an office, and I asked myself – probably for the first time ever – what’s it like to be that person? This film helped me to notice.